Those that have played for me know I'm all about conditioning. I would run my hardest drills and skating drills in the last half of practice. "Why you ask?" Because, when the game is on the line, I want to know you still have something left in the tank. Anyone can skate hard and fast right after you hit the ice. But what about when there is 1:30 left on the clock in the third period? What if you need to protect a 1 goal lead, or score a late one to tie it up. I want my players to know they have it in them to feel the burn in their legs and the drive in their heart to get to the puck and win battles. 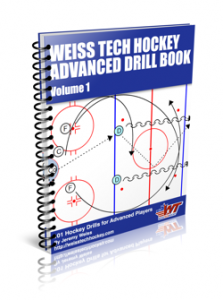 Jeremy over at WeissTech Hockey has a great drill to help with this.